← When Do We Get to the Fun Stuff? Happy anniversary! The United Church of Canada came into being 91st years ago on June 10th. All across this country, congregations and outreach ministries reflect their own unique communities as they try to live out the teachings of Jesus. Here at Sicamous United, we do that by gathering in community Sunday by Sunday for worship, encouragement, challenge and companionship. In our own homes, places of work, other volunteer activities we try to live out compassion and justice. Thank you for being a part of it all. A few things to catch you up to date on as the month of June continues. On Friday, June 3rd, on behalf of the congregation, I had the pleasure of handing out $4000 worth of bursaries to four high school grads – our way of investing in and honouring the youth of our community. We share the income from the Thrift Shop in many other ways in the community, this is just the most visible one. On Sunday June 5th we hosted a Thank You supper for all the Thrift Shop volunteers. Even though we are a small congregation, we are so fortunate to have a great manager and a volunteer base of about 60 people who help make our Thrift Shop ministry such a blessing to the wider community. On Saturday, June 25th @ 5:00 PM – everyone connected to the congregation is invited to the 3rd annual congregational BBQ at our house. We’ll supply the hotdogs, hamburgers, buns and all the fixin’s; you are invited to bring a salad, or desert to share. Our address: 790 – 9th Ave. N.E. Salmon Arm B.C. There is a yellow sign-up sheet on the round table at church, or you can respond to my email to let us know if you will be able to attend, and how many friends and family you may be bringing! Alas, the water feature wasn’t supposed to be part of the décor, but there it was, dripping heavily over the valance lights and exit sign near the piano. We are grateful to Ron Hyam who checked out the situation and made temporary repairs. However, it does look like a new roof over the sanctuary will be needed. Jim McConnell has met with Integrity Roofing to look at the situation and we are awaiting a few estimates for repairs or replacement. We’ll all need to chip in as best we can! and the wisdom to know that you already love me just the way I am. 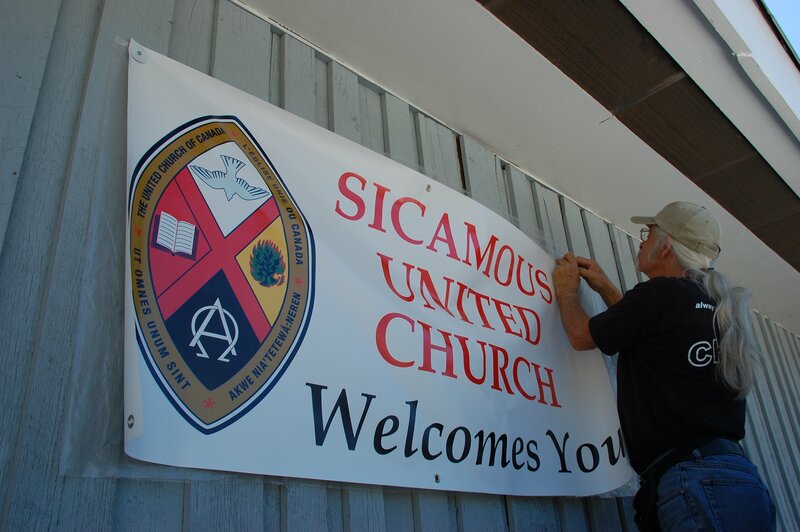 Jim and I will be on holiday for the month of July but worship will go on each week at Sicamous United, so please drop in, refresh your spirit and meet friends old and new.